This spring we plan to expand the Arnica section in the garden because our "Arnica Quick Stick" is such a popular seller. This daisy-like mountain flower is used traditionally to help relieve discomfort associated with bruises, sprains, soreness and swelling/muscle spasms from sports activity, and can help alleviate arthritis set off by seasonal change as well as general muscle and joint pain. We make a therapeutic salve with the Arnica that we've grown, harvested and infused all summer long. Combined with natural beeswax (purchased locally at Craftsbury Candleworks - LOVE your beeswax - it's so PURE !) a little bit of wild harvested St. Johnswort and some added essential oils to add a little heat it works wonders on troublesome joints or bruised areas. We package our Arnica salve in a trendy roll-on dispenser that makes it easy to apply to affected areas. This product is widely popular for atheletes, massage therapists and anyone looking for a natural remedy for aches, pains and sprains. 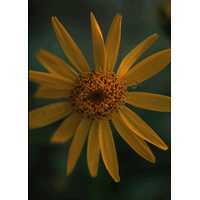 Arnica can be used for sore muscles, but it can also be used to stop those unsightly bruises. For example, if you bump your leg on the table, and gently apply our Arnica Quick Stick into the area, the Arnica will actually reduce the black and blue of the bruise and help the "sting" by improving circulation to the wound area. Look for upcoming blogs on some of our other herbal healing products, recipes and natural alternative therapy.